An Air France Airbus A330-200 was destroyed when it crashed into the sea while on transatlantic flight from Rio de Janeiro-Galeao International Airport, RJ (GIG) to Paris-Charles de Gaulle Airport (CDG). The airplane carried 12 crew members an 216 passengers. Flight AF447 departed at 19:29 local time (May 31) from Rio de Janeiro (GIG). The takeoff weight was 232.8t (for a MTOW of 233 t), including 70.4 tonnes of fuel. The captain was PNF, one of the co-pilots was Pilot Flying (PF). The flight progressed as planned with the crew contacting several air traffic control centres along the way. Cruising altitude was FL350. At 23:35 local time (01:35 UTC), the crew informed the Atlantic Area Control Centre (CINDACTA III) controller that they had passed the INTOL waypoint. INTOL is an RNAV waypoint located in the Atlantic Ocean, 565 km from Natal, Brazil. At 01:48 UTC the aircraft went out of the radar coverage of CINDACTA III, Fernando de Noronha. The meteorological situation in the area of AF447's flight path over the Atlantic was typical of that encountered in the month of June in the inter-tropical convergence zone. There were powerful cumulonimbus clusters on the route of AF447. Some of them could have been the centre of some notable turbulence. At 01:55, the captain woke the second co-pilot and said "[...] he’s going to take my place". The captain then attended the briefing between the two co-pilots, during which the Pilot Flying said, in particular "the little bit of turbulence that you just saw [...] we should find the same ahead [...] we’re in the cloud layer unfortunately we can’t climb much for the moment because the temperature is falling more slowly than forecast" and that "the logon with Dakar failed". The captain left the cockpit at 02:01:46 UTC. The airplane was flying at FL350 and at Mach 0.82 and the pitch attitude was about 2.5 degrees. Autopilot 2 and auto-thrust were engaged. At 02:06:04, the PF called the cabin crew, telling them that "in two minutes we should enter an area where it’ll move about a bit more than at the moment, you should watch out" and he added "I’ll call you back as soon as we’re out of it". At 02:08:07, the PNF said "you can maybe go a little to the left [...]". The airplane began a slight turn to the left, the change in relation to the initial route being about 12 degrees. The level of turbulence increased slightly and the crew decided to reduce the speed to about Mach 0.8. From 02:10:05, the autopilot then auto-thrust disengaged and the PF said "I have the controls". The airplane began to roll to the right and the PF made a left nose-up input. The stall warning sounded twice in a row. The recorded parameters show a sharp fall from about 275 kt to 60 kt in the speed displayed on the left primary flight display (PFD), then a few moments later in the speed displayed on the integrated standby instrument system (ISIS). At 02:10:16, the PNF said "so, we’ve lost the speeds" then "alternate law [...]". The airplane’s pitch attitude increased progressively beyond 10 degrees and the plane started to climb. The PF made nose-down control inputs and alternately left and right roll inputs. The vertical speed, which had reached 7,000 ft/min, dropped to 700 ft/min and the roll varied between 12 degrees right and 10 degrees left. The speed displayed on the left side increased sharply to 215 kt (Mach 0.68). The airplane was then at an altitude of about 37,500 ft and the recorded angle of attack was around 4 degrees. From 02:10:50, the PNF tried several times to call the captain back. At 02:10:51, the stall warning was triggered again. The thrust levers were positioned in the TO/GA detent and the PF maintained nose-up inputs. The recorded angle of attack, of around 6 degrees at the triggering of the stall warning, continued to increase. The trimmable horizontal stabilizer (THS) passed from 3 to 13 degrees nose-up in about 1 minute and remained in the latter position until the end of the flight. Around fifteen seconds later, the speed displayed on the ISIS increased sharply towards 185 kt; it was then consistent with the other recorded speed. The PF continued to make nose-up inputs. The airplane’s altitude reached its maximum of about 38,000 ft, its pitch attitude and angle of attack being 16 degrees. At around 02:11:40, the captain re-entered the cockpit. During the following seconds, all of the recorded speeds became invalid and the stall warning stopped. The altitude was then about 35,000 ft, the angle of attack exceeded 40 degrees and the vertical speed was about -10,000 ft/min. The airplane’s pitch attitude did not exceed 15 degrees and the engines' N1's were close to 100%. The airplane was subject to roll oscillations that sometimes reached 40 degrees. The PF made an input on the sidestick to the left and nose-up stops, which lasted about 30 seconds. At 02:12:02, the PF said "I don’t have any more indications", and the PNF said "we have no valid indications". At that moment, the thrust levers were in the IDLE detent and the engines' N1's were at 55%. Around fifteen seconds later, the PF made pitch-down inputs. In the following moments, the angle of attack decreased, the speeds became valid again and the stall warning sounded again. At 02:13:32, the PF said "we’re going to arrive at level one hundred". About fifteen seconds later, simultaneous inputs by both pilots on the sidesticks were recorded and the PF said "go ahead you have the controls". The angle of attack, when it was valid, always remained above 35 degrees. The recordings stopped at 02:14:28. The last recorded values were a vertical speed of -10,912 ft/min, a ground speed of 107 kt, pitch attitude of 16.2 degrees nose-up, roll angle of 5.3 degrees left and a magnetic heading of 270 degrees. The airplane struck the surface of the sea. Several attempts were made to locate the wreckage of the airplane. Finally on April 3, 2011, a search vessel using unmanned submarines located pieces of wreckage including an engine, landing gear and fuselage and wing parts on the Ocean floor. The crew, progressively becoming de-structured, likely never understood that it was faced with a 'simple' loss of three sources of airspeed information. In the minute that followed the autopilot disconnection, the failure of the attempts to understand the situation and the de-structuring of crew cooperation fed on each other until the total loss of cognitive control of the situation. The underlying behavioural hypotheses in classifying the loss of airspeed information as 'major' were not validated in the context of this accident. Confirmation of this classification thus supposes additional work on operational feedback that would enable improvements, where required, in crew training, the ergonomics of information supplied to them and the design of procedures. In its current form, recognizing the stall warning, even associated with buffet, supposes that the crew accords a minimum level of 'legitimacy' to it. This then supposes sufficient previous experience of stalls, a minimum of cognitive availability and understanding of the situation, knowledge of the aeroplane (and its protection modes) and its flight physics. An examination of the current training for airline pilots does not, in general, provide convincing indications of the building and maintenance of the associated skills. More generally, the double failure of the planned procedural responses shows the limits of the current safety model. When crew action is expected, it is always supposed that they will be capable of initial control of the flight path and of a rapid diagnosis that will allow them to identify the correct entry in the dictionary of procedures. A crew can be faced with an unexpected situation leading to a momentary but profound loss of comprehension. If, in this case, the supposed capacity for initial mastery and then diagnosis is lost, the safety model is then in 'common failure mode'. During this event, the initial inability to master the flight path also made it impossible to understand the situation and to access the planned solution. * The difficulty in recognizing and understanding the implications of a reconfiguration in alternate law with no angle of attack protection. This AD is a precautionary measure and requires the removal from service of all Thales Avionics P/N C16195AA pitot probes, the replacement of Thales Avionics P/N C16195BA pitot probes at positions 1 (Captain) and 3 (Stand by) with Goodrich P/N 0851HL probes and the installation at position 2 (First Officer) of a Thales Avionics pitot probe P/N C16195BA. Make it mandatory, as rapidly as possible, for airplanes performing public transport flights over maritime areas to be equipped with an additional ULB capable of transmitting on a frequency (for example between 8.5 kHz and 9.5 kHz) and for a duration adapted to the pre-localisation of wreckage. Study the possibility of making it mandatory for airplanes performing public transport flights to regularly transmit basic flight parameters (for example position, altitude, speed, heading). Ask the FLIRECP(19) group to establish proposals on the conditions for implementing deployable recorders of the Eurocae ED-112 type for airplanes performing public transport flights. Undertake studies to determine with appropriate precision the composition of cloud masses at high altitude. In coordination with the other regulatory authorities, based on the results obtained, modify the certification criteria. This AD requires a one time inspection of the Thales Avionics AoA probe P/N C16291AA in order to identify the suspect parts and to remove them from service. Requiring an amendment of the Flight Manual to ensure that flight crews apply the appropriate operational procedure when autopilot and auto-thrust are automatically disconnected and flight controls have reverted to alternate law. That ICAO establish very strict rules for the readout of such recordings in order to guarantee the confidentiality of the recordings. That EASA and the FAA make mandatory the recording: - of the position of the flight director crossbars, - of the parameters relating to the conduct of the flight displayed on the right side, in addition to those displayed on the left side. That EASA and ICAO make mandatory as quickly as possible, for airplanes making public transport flights with passengers over maritime or remote areas, triggering of data transmission to facilitate localisation as soon as an emergency situation is detected on board. That EASA and ICAO study the possibility of making mandatory, for airplanes making public transport flights with passengers over maritime or remote areas, the activation of the emergency locator transmitter (ELT), as soon as an emergency situation is detected on board. Proposed AD to require software standard up-grade of the three Flight Control Primary Computers (FCPC) by either modification or replacement. Requiring software standard up-grade of the three Flight Control Primary Computers (FCPC) by either modification or replacement. ICAO ensure the implementation of SAR coordination plans or regional protocols covering all of the maritime or remote areas for which international coordination would be required in the application of SAR procedures, including in the South Atlantic area. The DGAC, in concert with the other services responsible, develop a homogeneous framework for training and for approval of operators responsible for search and rescue activities in France. ICAO define the framework for the training of SAR operators in its standards and recommended practices. The DGAC designate a point of contact at ICAO for the ARCC that has adequate means to accomplish his/her missions. ICAO ensure each Member State has a national point of contact and makes his/her contact information available. The Brazilian and Senegalese authorities make mandatory the utilisation, by aeroplanes so equipped, of ADS-C and CPDLC functions in the zones in question. ICAO request the involved States to accelerate the operational implementation of air traffic control and communication systems that allow a permanent and reliable link to be made between ground and aeroplane in all of the areas where HF remains the only means of communication between the ground and aeroplanes. EASA ensure the integration, in type rating and recurrent training programmes, of exercises that take into account all of the reconfiguration laws. The objective sought is to make its recognition and understanding easier for crews especially when dealing with the level of protection available and the possible differences in handling characteristics, including at the limits of the flight envelope. More generally, EASA ensure that type rating and recurrent training programmes take into account the specificities of the aircraft for which they are designed. EASA define recurrent training programme requirements to make sure, through practical exercises, that the theoretical knowledge, particularly on flight mechanics, is well understood. EASA review the requirements for initial, recurrent and type rating training for pilots in order to develop and maintain a capacity to manage crew resources when faced with the surprise generated by unexpected situations. EASA ensure that operators reinforce CRM training to enable acquisition and maintenance of adequate behavioural automatic responses in unexpected and unusual situations with a highly charged emotional factor. EASA define criteria for selection and recurrent training among instructors that would allow a high and standardized level of instruction to be reached. EASA modify the basis of the regulations in order to ensure better fidelity for simulators in reproducing realistic scenarios of abnormal situations. EASA ensure the introduction into the training scenarios of the effects of surprise in order to train pilots to face these phenomena and to work in situations with a highly charged emotional factor. 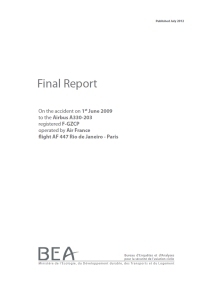 EASA require a review of the re-display and reconnection logic of the flight directors after their disappearance, in particular to review the conditions in which an action by the crew would be necessary to re-engage them. EASA require a review of the functional or display logic of the flight director so that it disappears or presents appropriate orders when the stall warning is triggered. EASA study the relevance of having a dedicated warning provided to the crew when specific monitoring is triggered, in order to facilitate comprehension of the situation. EASA determine the conditions in which, on approach to stall, the presence of a dedicated visual indications, combined with an aural warning should be made mandatory. EASA require a review of the conditions for the functioning of the stall warning in flight when speed measurements are very low. EASA improve the feedback process by making mandatory the operational and human factors analysis of in-service events in order to improve procedures and the content of training programmes. The DGAC take steps aimed at improving the relevance and the quality of incident reports written by flight crews and their distribution, in particular to manufacturers. The DGAC review the organisation of its oversight so as to improve its cohesion and effectiveness. The DGAC ensure the adequacy of the conditions of recruitment and training so that all of its inspectors have the skills required to exercise their functions. ICAO amend Annex 12 on search and rescue operations so as to encourage Contracting States to equip their search aircraft with buoys to measure drift and to drop them, when these units are involved in the search for persons lost at sea. Cockpit voice recorder (CVR) on the sea bed. Distance from Rio de Janeiro-Galeão International Airport, RJ to Paris-Charles de Gaulle Airport as the crow flies is 9152 km (5720 miles).